Product code: 1812 Categories: Sold Items, Sold Jewellery. Here is a magnificent antique ruby and diamond bracelet made in the former Austro-Hungarian empire and has the town mark for being made in Vienna and was made at the start of the 1900’s. Made in 14ct yellow gold, this bracelet is made up of wonderful flowing fancy curb links, and set with 2 vibrant natural rubies and 3 sparkling diamonds. 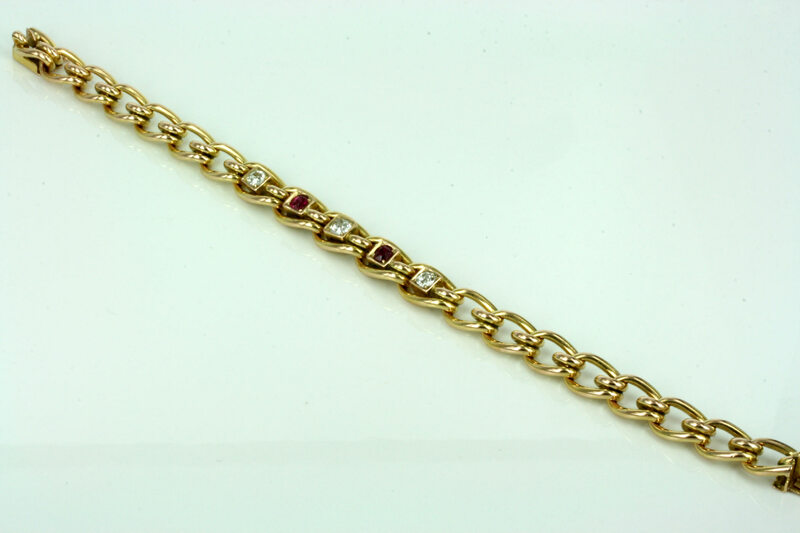 The rubies total 0.26 carats and the diamonds total 0.68 carats and the combination of both the rubies and the diamonds give this gold bracelet so much charm and appeal. Measuring 19.5cm in length, this Austro-Hungarian ruby and diamond bracelet is sure to delight the new owner.